Looking for private in-home or in-studio Violin lessons? Our Violin teachers are ready to get you started. Find your teacher today! The average cost of 60-minute violin lessons is $66. While the exact cost will vary depending on the teacher, type of lesson, and your location, you should expect to spend anywhere between $20 and $200 per hour. For the best experience, we typically recommend 60-minute violin lessons. However, students looking for a more affordable option may want to consider a shorter lesson length of 45 or 30 minutes. On average, 45-minute violin lessons are 20% less expensive at $53, and 30-minute lessons cost 43% less at $38. Curious how much violin lessons cost in your area? Do a quick search to get local prices for the best violin teachers . laining techniques. I could not have asked for a better Violin teacher. Very happy with my lessons. I have taken a little hiatus and now back and buying the packaged deals for more lessons with Ms. Addy"
New York, NY teacher: Antoinette A.
much. He has her progressing beyond where I thought she would be, having only been playing for a few months and I believe she will keep at it with him as her instructor!" "Anthony had an excellent first violin lesson with Wilma." ing and caters to my needs. Go Jackie! You’re the best!" in is that she spends a lot of time focusing on the fundamentals. This has been invaluable for my daughter. Her skills have advanced considerably under Erin's tutelage. Highly recommended violin instructor." iolin, and there is so much to learn. I played only a few notes in my first lesson, but his instruction was worth every penny. I am very excited for the next lesson and look forward to learning everything I can from Farobag. Highly recommended." "Very patient instructor. Can't wait to take another lesson." New York, NY teacher: Erica Q. All together are basic fundamentals. My job as a teacher is to help you find a place for music in your daily life and to make a practice time more of an experimental discovery play, than boring work. Once you find a key, it opens up a whole new world of communication. As a private violin instructor, I believe that education is impossible without student’s motivation and passion. Perhaps you have decided to become a professional musician or maybe you want to play for your own enjoyment... Whatever your goals are, I can lead you there! Let's make it happen together because it is never late to follow a dream! I recommend younger children travel to me for the best learning experience. Zhana is such a kind, thoughtful, and patient instructor! Our lessons give me the perfect balance of structure and fundamentals, along with playfulness and exploration. She is able to make the connection between the technical aspects of the basics and the musicality of a piece. Zhana regularly plays with me during our lessons, which has really helped me hear my intonation and what correction is needed. She is very understanding of the fact that I am an adult learner and do not always have the opportunity to practice as much as I like, but at the same time she is constantly encouraging me to learn more and improve my technical abilities. I would highly, highly recommend Zhana as a teacher for anyone looking for a new teacher! We really love Zhana. Very attentive and thorough teacher. Spends a lot of time on proper technique. Always finds a way to encourage a young learner. We are very happy to know Zhana! My daughter enjoys taking violin lessons with her. Zhana is very kind, responsible, and her instruction effectively improves technique and inspires enthusiasm for music. Students can expect to learn excellent fundamental technique, tone, musicality, and basic music theory skills to allow them to read perform beautiful music! Martin is a colleague of mine; we have worked together at Lincoln Center and in recording studios in NYC. I believe he would be a wonderful teacher, patient and knowledgeable. He is well versed in the Dounis method of violin pedagogy. Martin really knows the in's and out's of violin playing and teaching. He's worked with some of the best teachers and can tell you things very few other teachers know. He's got a great sense of humor and is super organized. Wonderful teacher. I love teaching adults because we can build up meaningful relationships and have intriguing conversations through music! I am fully equipped to teach from absolute beginners to semi-professionals who had chosen a non-music career path. Let's work together to achieve your goal, and make beautiful music. The violin is one of the most empowering musical instruments to learn, and has frequently been the subject of many music research studies. It has been found that those who learn to play the violin have also benefited in other areas of their lives. Those who play the violin demonstrate enhanced concentration, as well as increased math, memory and reading skills. Although the violin is known best for its use in classical music, it has become a far more versatile instrument that has also been used in country, folk and even popular rock. Whether your goal is to play Beethoven, an Irish jig, or a lively fiddle tune, taking lessons can help you become a well-rounded violinist. Because the violin is such a complex instrument, finding a violin instructor with skill, patience and extensive knowledge is essential. Finding the best teacher for you is one of the most important parts of your musical journey, and specialized instructors can bring forth the virtuoso that lives within. Taking private violin lessons will give you the feedback and attention you’ll need to hone your skills. 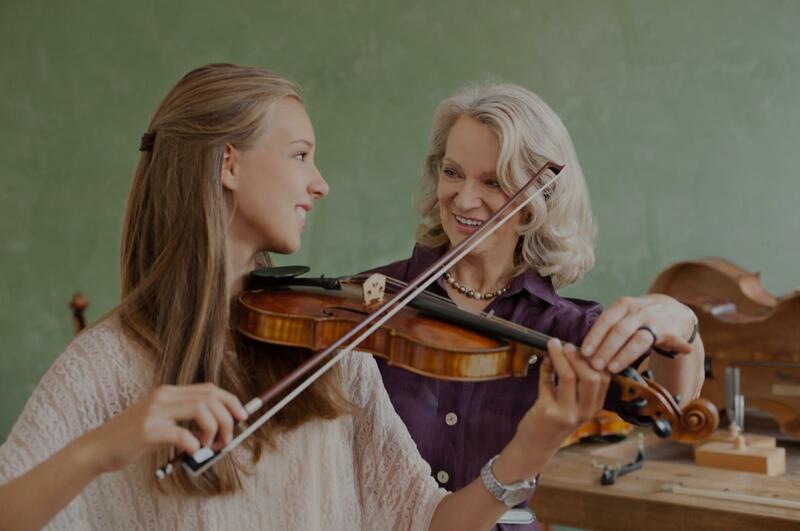 Private Violin lessons with a TakeLessons instructor are tailored to each student based on their current skill level, and goals. Beginner students get easier songs, easier exercises, and simpler techniques. From there, the difficulty increases in order to properly challenge and motivate intermediate and advanced level violinists to develop greater skills, to stretch their preconceived limitations, and to ultimately gain more satisfaction, meaning, and pleasure from the Violin. We understand advancing violinists may also have professional goals, so our teachers can counsel you to increase your chances of getting more and higher paying gigs. Who knows, someday, you too can become a TakeLessons Violin instructor and get paid to teach other aspiring violinists like you. If you’re the type of parent who believes music can improve early childhood development, science has good news for you. A recent study suggests that Violin practice can help children better and faster process music and language. Hearing different pitches and tones can help one better parse spoken words. So while every parent needs to be careful not to forcefully involve their little ones in music, sports, and other interests, parents can still take a gentler approach that stimulates joy and curiosity, and plant a seed for lifelong learning. Science also has good news for kids older than preschool age. Research suggests music lessons improve academic performance, as well as cognitive skills in children. Violin lessons and practice can help improve motor skills, cognitive performance, and listening skills at a young age. The last thing you want to do is force a kid into playing and practicing so much that they begin to flame out and reject something as beneficial as the Violin. This is why it’s important to have someone that holds you accountable for prolonging your learning and practicing, regardless of whether it’s a musical instrument, or a sport, or any other after-school matter. Someone to keep you motivated. And if you decide to make your passion a profession, someone to guide you along the way on how to find the right opportunities for paid gigs, or even a full-time career in playing the Violin. Let’s be honest, private lessons aren’t the best idea for college students who are generally tight on budget, time, and commitments. However, that doesn’t mean you should stop learning and practicing. You can still work the Violin by taking classes or participating in music programs at your college. These tend to be more affordable, more social, and less stressful than trying to fit private lessons into your routine. By now, you’ve already decided whether to stick with the Violin or to drop it. If you’re one of the lucky few that stuck with it, in spite of having an extremely busy schedule with work and family obligations, congratulations. Contrary to popular belief, taking the time out for routine Violin practice has tremendous benefits, even for the busiest of people. We believe that Violin practice as an adult is more productive than it seems because it clears your head, it builds patience, discipline and concentration skills which you can transfer over to other parts of life, and it keeps your hand-eye coordination sharp. It also keeps you committed to learning and improvement, which again, are transferable traits to professional life. As role models, parents taking active classes shows kids the importance of pursuing personal interests for life. A new study on the long-term benefits of music lessons reports that older adults who took lessons at a young age process the sounds of speech faster than those who did not, regardless of whether it was a violin, a harmonica, a ukulele, or any other instrument. Even if you’ve never played a musical instrument or shown any interest, it’s never too late to start. Even latecomers can fall in love with something as timeless as the Violin. Age isn’t a relevant factor, when it comes to curiosity, pleasure, and determination. Another music study at Duke University found that brain activity while listening to violin classical music showed unique brain activity for when a patient was listening, reading, and imagining playing music, and that the entire area of the brain fires on all cylinders providing for a whole body experience. And here’s a comparison of your brain on music versus your brain without it on NPR. Learn about violin basics and advanced techniques such as the anatomy of a violin, scales, playing ranges, acoustics, chords, strings, finger placement, and the fingerboard. Learn how to hold the bow, and different bowing techniques such as detache, tremolo, pizzicato, and more. Learn how to properly tune a violin in order to produce beautiful sounds that can only come from violin music. Learn how to play the violin by reading sheet music, and by ear. Learn about productive violin practice, and how to effectively play solo or in an orchestra. Learn about the violin instrument family of stringed instruments, such as the fiddle, viola, cello, and bass, and their unique characteristics. Learn about the different genres of violin such as classical music, jazz, folk music, Indian classical music, fidding, and more. Check out this video for a free lesson on violin finger positions. A free video lesson on playing violin vibrato. A video tutorial on how to properly tune a violin. A free violin lesson on scales for beginners. A free violin lesson on how to hold a bow. A free 15-minute lesson on violin practice. A free video lesson on how bowing technique affects violin tone. • Each student will receive customized violin lessons. Instructors will assess your interests, age and skill level so you’re provided with an experience tailored specifically to your needs. • Students have access to lesson journals online to keep you motivated and on track. • Choose from an incredible list of local instructors or online violin instructors who are knowledgeable, friendly and certified. • And don’t worry – if for any reason you’re unhappy with your lessons, you’re protected by a 100% money back guarantee.